To ensure you have blooms all summer long, try this method of planting that has worked really well for my garden: For example, let’s say you want to grow some zinnias. 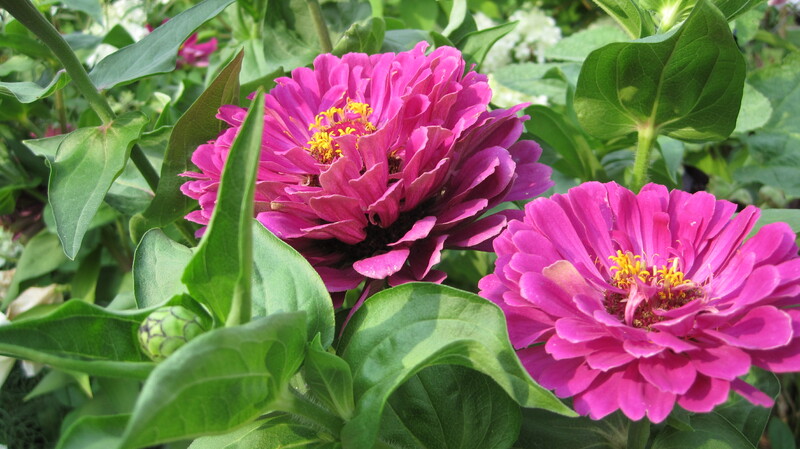 Buy some zinnia plants and buy some zinnia seeds (I like cut-and-come-again from Seed Savers). First, plant your plants. When your area is all planted with plants (for the most part, anyway; I am forever rearranging and planting all season long), sprinkle some of the zinnia seeds. Plant the seeds every 2 weeks through the July. This will guarantee loads of blooms all summer long. So when your first plants bloom and then go to seed, your little seedlings will be up and blooming and the cycle continues through the first hard frost.